These elegant, poofy canines are probably one of the most recognizable show-dog breeds in the world. But what’s the best dog food for poodles? What do you feed a dog that’s equal parts regal and mischievous—all at the same time? That’s what we’re going to talk about in this article. Many people see Poodles as weak and delicate—though this is actually a misconception. Contrary to what many people think, they were originally bred as water retrievers. There are actually three different sizes, though all of them are still considered Poodles. There is the Toy Poodle, the Miniature Poodle, and the Standard Poodle (arranged from smallest to largest, respectively). Poodles are probably best-known as show dogs, but they’re also intelligent. They’re awesome at sports, do well in obedience training, and even make great hunting dogs! As one of the oldest of modern dog breeds, Poodles are believed to have been bred for waterfowl hunting in Germany—though it’s also been said that they underwent a lot of their development in France later on. Their earliest known ancestors are believed to have been Asian herding dogs, though it’s also possible that they have the blood of many different types of ancient water-dog breeds in their lineage. How Much Should You Feed a Poodle? Since there are three different sizes within the Poodle breed, it’s important to draw a distinction when it comes to body weight. Toy Poodles grow to a height of about 10 inches, and will end up weighing about 6 to 9 pounds. Miniature Poodles stand a bit taller—somewhere between 11 and 15 inches—and will weigh somewhere between 15 and 17 pounds as adults. 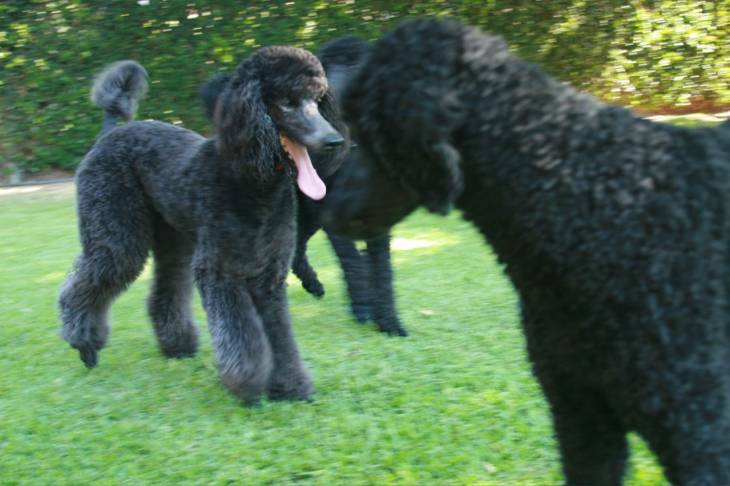 Standard Poodles are the largest of the breed. This type will grow to an average height of 22 inches, and will end up weighing somewhere between 45 and 70 pounds. As far as calorie requirements are concerned, a less active Toy Poodle will require about 240 calories on a daily basis. A moderately active dog of this size will need about 300 calories a day, while a highly active animal will need something closer to 465. A less active Miniature Poodle will need about 400 calories per day. A moderately active dog of this type, on the other hand, will need more—about 490 calories a day. A highly active dog within this weight range will need even more—requiring somewhere around 775 calories each day to stay energized. A Standard Poodle, which is the largest of the three types, will need more calories to fuel its larger body. A less-active dog in this category will need about 1,000 calories per day—while a moderately active dog of the same size will require about 1,230. A highly active dog of this breed (and size) will require somewhere around 2,000 calories—though remember that every dog will be a bit different. Calories per day should be based on weight and the dog’s individual energy level—so try to pay attention to how much your dog eats, and do your best to gauge whether or not the animal is getting enough to stay energetic throughout the day. Also, with Poodles, (which are susceptible to bloat) it might be a good idea to feed them in two or three smaller feedings than all at once. Need More Information About Poodles? Check Out This Video! This video, from the popular Dogs 101 series, provides some awesome information about Poodles as a breed, talks a bit about their history, and discusses their primary attributes. If you’re thinking about getting one, or already have one and are now just looking for a little bit of information, then this video does a fantastic job of providing a basic overview. Poodles are actually a pretty healthy breed, in general—though there are a few common ailments to look out for. Not every poodle will experience every one of these problems, but it’s a good idea to be aware—just in case. This condition, also known as ‘Addison’s Disease’, is brought on by a problem with the adrenal gland that causes it to produce less of the adrenal hormones than it’s supposed to. Some symptoms of the disease include vomiting, poor appetite, and lethargy. If left untreated, it can be very dangerous and even result in death—though you’re not powerless in helping your dog to prevent and cope with it! According to this article, you cannot cure Addison’s disease through diet alone, but you can help your dog to cope with it better by cutting out foods that contain wheat, corn, and soy. Instead, look for high quality, animal-source ingredients and create a diet that’s as close to raw as possible. Cushings Disease, also called Hyperadrenocorticism, occurs when the dog’s body produces too much cortisol. It’s a pretty serious condition that’s almost always caused by a tumor, and will require a vet’s attention as soon as possible. Some possible symptoms include increased drinking and urinating, panting, increased appetite, and an increase in susceptibility to skin and bladder infections. When it comes to food intake and how it might affect this disease, it’s theorized in this article that dogs with the condition might do better on a reduced-fat diet, as there tends to be a pretty strong tendency toward obesity in pets that suffer from it. Anti-oxidants, such as those found in fish oils, might also be helpful. Other conditions that can affect Poodles include bloat, Epilepsy, Hip Dysplasia, Hypothyroidism, Legg-Perthes Disease, PRA, and Patellar Luxation. To ensure your dog’s continued health, it’s important to feed a diet based on holistic, well-rounded nutrition—and to schedule regular, routine trips to the vet for checkups and tests. Poodle puppies can generally begin the weaning process sometime between 3.5 and 5 weeks of age. At this point, the puppies can begin to supplement their mother’s milk with a little bit of pulverized, milk-soaked kibble. Most people switch their Poodles over to adult food between the ages of 4 to 6 months—though switching earlier might not hurt anything if the dog seems large enough to handle the adult-sized food. Since Poodles come in three different sizes, their daily caloric needs should be based on their weight. At five weeks, a puppy that weighs about 1 pound will need about 60 calories per day to stay active, while a Poodle puppy that’s closer to 2 pounds will need something closer to 100 calories a day to stay energized. Feeding a Poodle the right way will require a high-quality, holistic food option that’s a cut above the competition—which is why we make it a point to recommend Earthborn Holistic Primitive Natural Grain-Free Dry Dog Food for this breed. Earthborn Holistic Primitive contains a surprisingly minimal number of natural, holistic ingredients—providing nutrition that’s very close to a real ‘raw foods’ diet for your Poodle. It’s also grain-free, which is important for Poodles who tend to suffer from bloat or are at-risk for Addison’s disease. It also contains Whitefish Meal. White fish contain fish oil, and are an excellent source of Omega 3 fatty acids, which are super-important for eye and coat health. In addition, chicken fat (another ingredient in Earthborn Dog Food) serves as a quality source for linoleic acid—which is an Omega 6 fatty acid that’s also useful for coat health (since a Poodle’s hair doesn’t stop growing, Omega fatty acids will help to keep it healthy and youthful). 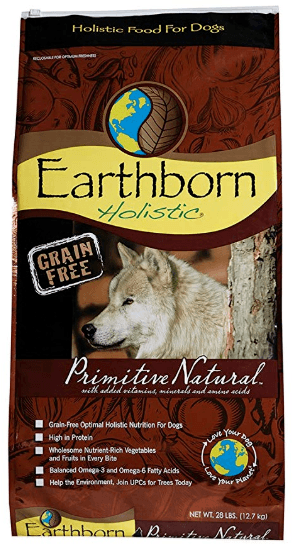 If you’re looking for a holistic, grain free, high-quality kibble for your Poodle, then we would definitely recommend Earthborn Holistic Primitive Natural Grain-Free Dry Dog Food. 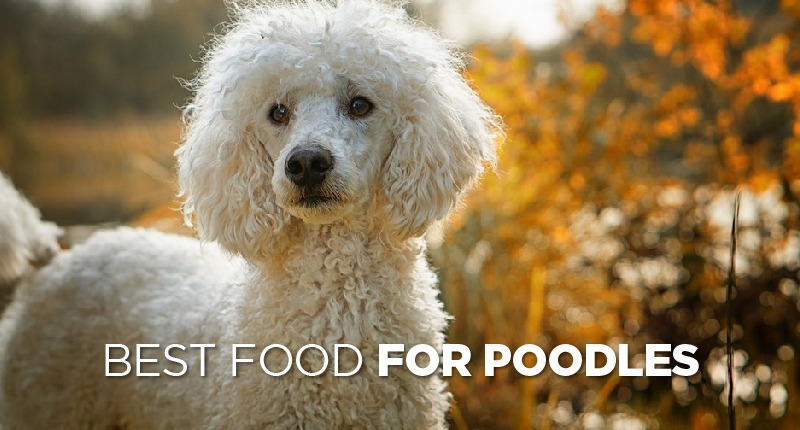 There are more than a few high quality dog foods on the market today—but in our minds, this one simply stands out above the rest, and definitely deserves a place in your Poodle’s food dish.